Horror comedies can sometimes walk a fine line, if both parts don’t mesh, the film will be forgotten to mediocrity. 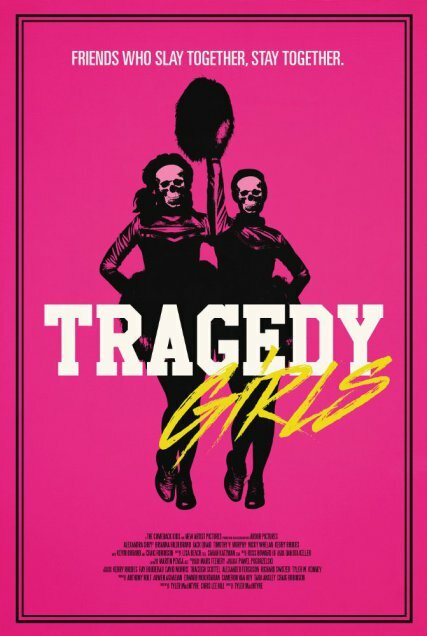 For the most part, Tragedy Girls does a decent job with the mix. While the film skews younger, due to many of the social media aspects, older horror films should still find enough here to enjoy. Or at least not hate if someone younger wants to watch. McKayla (Alexandra Shipp) and Sadie (Brianna Hildebrand) just want attention and for people to take their blog seriously. They come from radically different homes and support structures, but have always been there for each other. The girls are hot on the trail of a local serial killer that has taken the lives of four girls in their somewhat sleepy town. They are able to trick and lure him into their clutches, while unfortunately a young man gets used as the bait. Kevin Durand plays our original killer Lowell. I really enjoy Durand in just about every film he’s in and this is no exception. I just wish he was used a little more in this film. After McKayla and Sadie capture Lowell they show no remorse in torturing him. They also have no problem disposing of the body of the young man from earlier. So early on we are shown that the girls have no remorse and will go to any lengths to be popular. Now the film takes us on a journey where the ladies deal with any perceived threats and they can increase their views/hits. The middle third is the best part of the film and I won’t spoil who they take out, but it often ends with hilarious results. Among all the killing there of course is the build up of people trying to wedge in between the girls. Both from Lowell who is trying to escape, and Jordan the sheriff’s son who helps edit the videos for their blog. Will true friendship win out in the end? Or will one of the girls have a change of heart? I won’t go more into the main story as to not spoil it. However, it does lend itself to be predictable every step of the way. You may not be able to see whats happening twenty minutes down the road, but once the scenes are set up the next five minutes play out just like you would think. There are a few other minor issues I had with Tragedy Girls. First off, they tie Lowell up with the smallest zip ties possible. How he doesn’t break out right away, but then magically does a week later when the plot requires it, bothered me. I mean there has to be a better way to portray an escape. Jordan the love interest (Jack Quaid) is clearly not in high school. He’s only 25 according to his profile but looks older than that. I know people in their 20’s play high schoolers all the time, but he made me laugh every time he came on screen just from not looking the part. The last twenty minutes also devolved from smart comedy to just a little too silly for my taste. The satire was gone and they just went for the easy jokes. Other highlights include Craig Robinson as Big Al. He showed up a lot in the trailers and promo materials I saw. Not surprising since he is one of, if not the biggest names in Tragedy Girls. While his overall screen-time was more of a side character, he was spot on. Many horror fans will also like the gore. Not only is it well done, but at times there is a lot. The kills themselves were interesting and had certain flair to them. While many bemoan horror films skewed to a young generation, Tragedy Girls may shrink the divide. It does carry an “R” rating so it may not be appropriate for the younger generation. However, older horror fans will find parts to enjoy even if they don’t care for the social media aspect. While younger fans will get a taste of the gore and brutality that is missing from many recent horror titles.